The top two ranked teams in Class 5A battled into overtime for the second time this season with the No. 1 ranked McIntosh Chiefs pulling out a 2-1 Class 5A state championship victory over the No. 2 ranked Clarkston Angoras at Mercer University’s Five Star Stadium in Macon. The two teams went back and forth for 62:51 tied 1-1 when a corner kick by McIntosh (22-1-0) was battered around in front of the Clarkston goal and bounced to an open Logan Brown who put it into the open right side of the goal to put the Chiefs up 2-1 with 1:21 to play in overtime. 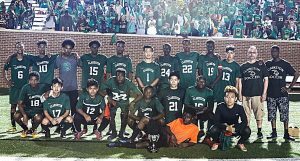 The Angoras (19-2-1) never got a good look at the McIntosh goal and the Chiefs were able to run out the clock to claim the state championship in a hard fought matchup. Clarkston, playing in just its second state title game and first since a 1989 4-3 loss to Lovett, struck first in the game on a big blast from way out front by Lionel Touroudo with 25:12 left in the first half to go up 1-0. The goal came off a nice pass from Elie Tshiamala. Angora goalie Bismark Dansou came up big with a pair of saves over the next four minutes of play to keep Clarkston’s one goal lead. McIntosh’s Dylan Keyser picked up a rebound off a teammate’s corner kick and slipped a shot into the goal to tie the game at 1-1 with 14:12 left in the first half. Both goalies came up with key saves in the final eight minutes of the first half. Dansou knocked a shot away with a sliding move and scrambled to his feet to deflect another shot with 7:50 to play in the half. 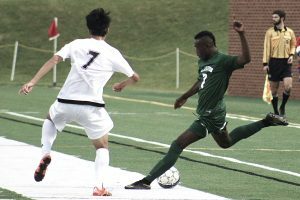 McIntosh turned up the pressure in the second half with the Angora defense turning away repeated attempts, including a big play by Stervens Jerome to get a ball out of the danger zone in front of the goal with 4:07 to play in the game. Touroudo got off a pair of shots at the corner of the McIntosh goal in the final two minutes of regulation which were turned away by the McIntosh goalie, including one as the clock ticked down to one second. The first overtime period was pretty quiet and the two teams remained tied at 1-1 heading into the second five minute period of overtime. Touroudo hit a shot just wide with 2:38 to play and McIntosh got up the field in a hurry. A close out of bounds call set up the Chiefs’ with the corner kick that led to winning goal by Brown. The 19-2-1 season for the Angoras set the best overall record for a Clarkston boys’ soccer team besting the 16-2-1 record of 2015 also under the guidance of Coach Andrew Goodman. Both losses came at the hands of McIntosh. The Angoras have fielded a soccer team since 1971. Lionel Touroudo’s goal gave him 10 on the season to go with a team leading 10 assists. The 10 assists ties him for fourth in the DeKalb County soccer stats.